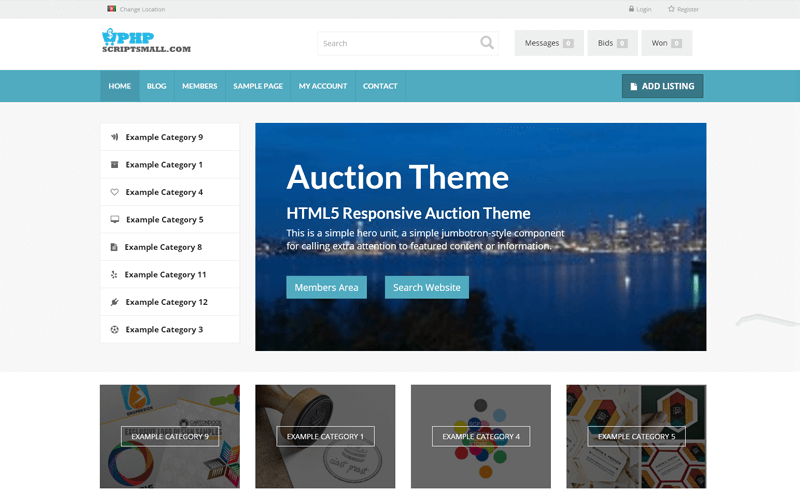 Our new Website Auction Script is developed beyond the technology for every business by integrating the negotiation and auction site in one place with advanced user preferable customization. This Auction script has more unique features with multi-site security with unlimited categories and sub-categories. The main aim of our script supports a range of different media types allowing your members to upload and share their content with ease. The upload process is clean and simple making it easy for users to add listings. The best site to set the listing packages based on the package features. The Auction Portal Softwarehas both free and paid auction listings based upon the user choice, the new user can register their account with their mail id and password, the Two Factor Authentication security method which is highly recommended in the higher officials and professionalsites. The account confirmation is sent through the user mail and then the user can log-in to the profile can find the clear homepage display with the number of featured categories, the user can add the listing by entering the title, details, price, keywords, attachments like images and documents, location etc. Then the user can select the listing packages and can make the online payment through the payment gateway integration. In our Advance Auction Script,the user can search for the particular auction by entering the keywords, minimum and maximum price in the advanced search box filter where the user can get the fast response for the user query. The auction for every business can be listed up, so the register members can place their auctionsby biding the amount on the particular product or business. The user can place the bidding amount by seeing the image, description, id, condition, views, seller details, the number of bids, and highest bid details in the side of the product pop-out screen. This Auction Portal Softwarehas the bidding history where the users can view the history of the bidding, once the completion of the feedback the user can give the feedback about the auction regarding the transaction and provide a user rating which will show up on the seller’s profile.In thisAdvance Auction Script,the site admin can manage all the pages in the site with easy access with log-in credentials, where the admin can manage the user details, product management details, user feedback details, and general page settingsetc. Our Website Auction Scriptis the flexible place for all kind of business modules which includes digital products, real estate and used goods etc, to take place an auction with user-friendlycustomization and secure coding. Along with the purchase of the script we offer you 1-year technical support, 6-months free update and brand-free site with zero bug free coding. Thank you for such a super fast and awesome support!!! I must say thanks for this script I never purchased a better script compare to this one! These guy’s works are simply fantastic s and it having very easy to customization options. These guys give the amazing customer service. The script delivery times are just extraordinary. If anyone looking for buying script don’t feel to hesitate!!! I strongly recommended!!! Easy to customize, Good Documentation, Clear Code, Powerful Features you’re done excellent Job!! !